'Sweet Hearts' was the last Gottlieb EM game to have a Gobble Hole. The last EM game by any Manufacturer to have a Gobble Hole was Williams '1964' San Francisco. NOTABLE FEATURES : Flippers (4), Pop Bumpers (2), 10 - Bank Drop Targets (1), Kick-Out Holes (2). The 4 - Player version is Gottlieb's 1973 'Jack In The Box'. NOTABLE FEATURES : Flippers (2), Pop Bumpers (3), slingshot in pop bumper area, Ramps (2), Roll-Under Spinner (1), 2 - Ball Multiball. Upper level Bagatelle Mini Playfield, Plunger lane has elevated skill shot to drop the ball to a kicker which kicks the ball into the pop bumper area. Heartbeat Ramp ( Centre Ramp ) is a duel - path ramp which diverts the ball either to the right lane or the plunger lane, depending on the balls path. Stephanie Rogers plays the voice of The Machine. NOTABLE FEATURES : Flippers (2), Pop Bumpers (4), Passive Bumpers (4), Kick-Out Holes (1), Stand Up Targets (2), Slingshots (2), Horseshoe Lane. go unnoticed by an uninformed player. Once the current ball in play reaches the outhole, the ball counter does not increment, the ball is served again to the shooter lane, and the A-B-C-D bumpers turn off to allow a new extra ball to be earned. The add-a-ball version of this game is Williams' 1968 'Cue-T'. Compare the playfield to that of Williams' 1966 '8 Ball'.The original name for this game was 'Miss Q' (a play on the billiards term 'mis-cue') but Williams learned the French translation of that was sexually derogatory, so they had to quickly alter the name. It is believed this change occurred before production started. Features 8-Ball or 9-Ball option. 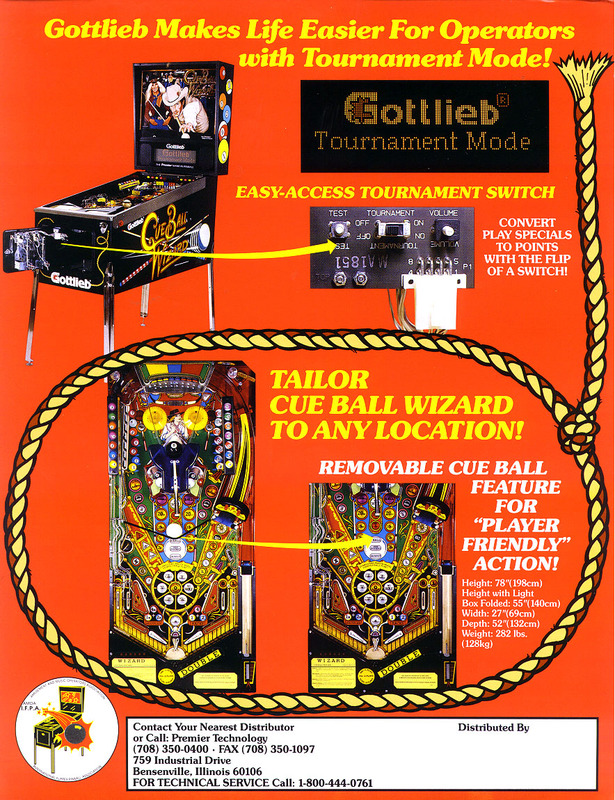 NOTABLE FEATURES : Flippers (2), Ramps (2), Multiball (3 Modes), Autoplunger. The flippers have a lightning bolt pattern molded into them and reportedly are 1/8 inch shorter than the standard Williams flippers. Under-the playfield magnet moves pinball for Mist Multiball. 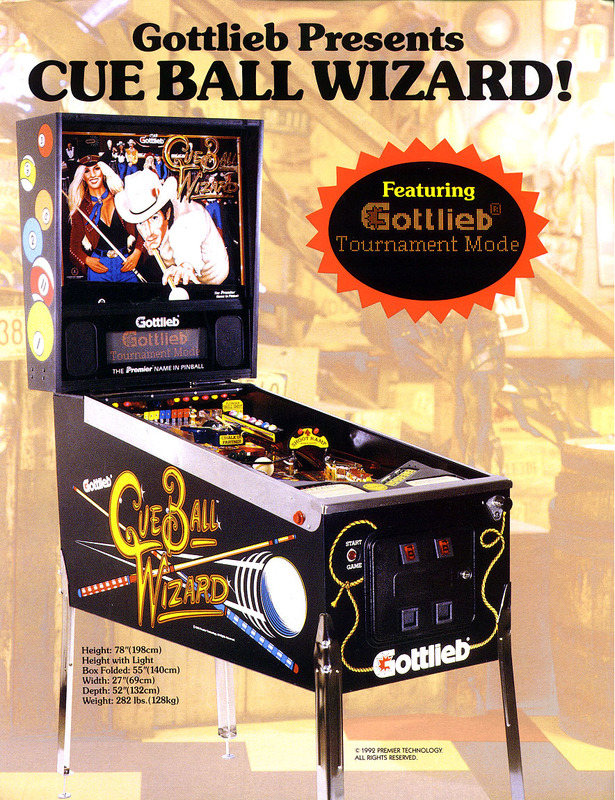 A player can get two or three multiball modes going at the same time for a total of a 4-ball multiball. Hitting an Advance causes the Rotary Target Selector to step one position. Each selector position lights different targets and rollovers for increased values. The selected combination of values carries over to the next game. NOTABLE FEATURES : The first game released under the Pinball 2000 (PB2K) concept. ART BY : John Youssi, Greg Freres. Revenge From Mars was the last pinball made under the 'Bally' label. NOTABLE FEATURES : Flippers (2), Slingshots (4), 7-bank drop targets (2), Standup targets (21), Kick-out holes (3), Captive balls (2), Kick-target (1), 2-ball and 3-ball Multiball. Two video modes. Oscillating captive ball kicker on elevated mini-playfield. Full-sized captive cue ball on lower playfield. Two standup targets are elevated and can only be hit by the captive cue ball. This cue ball can be removed from play as an operator option. "Gottlieb Presents CUE BALL WIZARD!" NOTABLE FEATURES : Flippers (2), Pop Bumpers (3), Drop targets (3),Kicker lanes (2), Kick-out holes (2). No slingshots. 4-player version of this game is Gottlieb's 1977 'Bronco'. NOTABLE FEATURES : Flippers (2), DC Pop Bumpers (3), Standup targets (6), Spinning Target (1), Upper right kickback lane, DC slingshots. The backglass artwork appears to have been inspired by drawings found in the book National Geographic on Indians of the Americas: a Color-Illustrated Record, first printed in 1955.